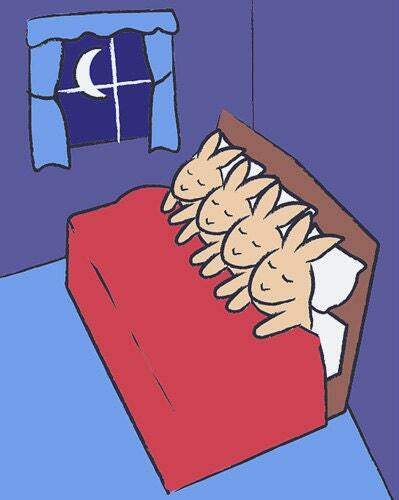 These little bunnies are tucked in and tuckered out! Brighten up a room with this adorable print featuring the little bunnies all snuggled up in their bed at night. Perfect for a child's bedroom / nursery or for bunny lovers of all ages. Listing is for print only. Frame and mat not included. Both paper choices will provide vibrant, crisp colors on a heavyweight matte stock. The 100% recycled paper is a more eco-friendly option, but some subtle imperfections may appear within the sheet. Very cute and well made, would order again! Very cute and well made. Would order again! We accept credit card payments through Etsy or through PayPal (with or without a PayPal account). For personalized products, refunds can only be issued if you request this before you receive the first proof. For other products, convo me within 14 days of receiving the item to request a refund or exchange. Shipping charges are not refunded. Shipments are made via USPS within 3 business days of purchase (excluding made to order or custom ordered items). Delivery confirmation is available for all domestic (US) orders and some international orders. NOTE: By default, we ship via USPS First Class Mail. USPS First Class Mail usually arrives within 3 business days (inside the US) from the date of shipment, but there is NO GUARANTEE of this time frame. Items may be delayed in transit. If you have a deadline for receiving your item, Priority Mail is available as a shipping upgrade. Items shipped with USPS Priority Mail generally arrive within 3 days (inside the US) or within 10 days (internationally) from the date of shipment.